(SEE AVAILABILITY ABOVE FOR ESTIMATED DELIVERY) - Sock & Stocking Aid with Built - Up Foam Handles Pediatric, 6½"L, 24" (16.5 - 612cm) Cord - Sock & Stocking Aid with Built - Up Foam Handles - Easy - to - use aid helps individual pull on sock or stocking. Just place sock over the flexible plastic core, insert foot & pull the cord"s two soft, foam handles to bring sock over heel & up leg. 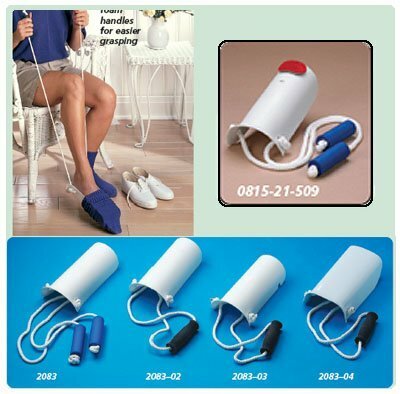 For one - handed use, use the Continuous Loop cord with foam handle. Latex free. - Rolyan products are internationally licensed & manufactured for home & clinical use. Most of their products offer a lifetime warranty.